This is the sequel to the earlier post on No Man's Land; a scrutiny on the gauges set for ongoing and proposed infrastructural works in Kerala. When in Part I we saw how myopic criteria is going to handicap the state, now lets have a look as to how political double standards, procrastination and Ideophobia have started excruciating it. So, all happy and sober? The last time I travelled from Cochin Airport back home, it took me 6 hours and 20 min to cover the 250km 'highway' to Trivandrum, courtesy my 2.6 L SUV and a desperado driver. Out of that, 1 hour and 40 min to negotiate the unruly Cochin rush-hour, a chaotic toll-plaza(toll hut, to be precise) and a half-finished Bypass to reach Aroor, just 40 km from CIAL. If an average speed of 40km/hr I managed on that highway is a luxury, then imagine the condition when all the proposed developments are realized. Kerala is fast heading for the concrete wall, without a helmet or even a brake to help us. The only answer to get out of the mess is to resuscitate the almost dead Expressway plan. I'm not going into the extremely ridiculous accusations against the project when it was conceived half a decade back. The only flick which always runs well in Kerala, the politics, once again spells doom for our state with the Expressway being the culprit this time. Kerala Expressway was conceived by the old Nayanar Govt, taking into consideration the huge container traffic load on the highway post Vallarpadam. When the A.K. Antony Govt continued with the same plans, the Leftists cried foul and sabotaged the project. Rising public opinion against a big project in Kerala is just like plucking a flower from your own garden, and the leftists successfully buried their own brainchild; without a pinch of regret or shame. And now when they are back in power, the project is back, but in a rechristened form. Our Road Transport Minister has 'discovered' that Kerala will need an expressway in future.. Wow, that's a big improvement, i must say, and he takes one step further in naming the road: Friendshipway...(He claims Russia uses that term for their expressways). Now Mr. Minister, you can call it Freeway or Comradesway(yeah, we have no objection) or North-South Highway(that was what his predecessor Joseph called it before he went on that airplane) or whatever you want, but give us a new access controlled road running the whole length of the state as soon as possible. You've the plans, the budget studies, the alignment and the expertise...All you now need is to show the guts to make this a reality; for the 38 million inhabitants of Kerala. Your party has shown the green signal as well... West Bengal has already built one, the Kolkata-Durgapur Expressway, and is planning more. 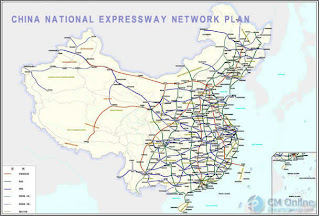 Hey, China, your best pal builds 24km of expressways a day! Ah, we dare not try beat them (and hurt you), but why not join them? We may not need a 100m wide road as envisaged earlier. Considering the demographic and topographic features of Kerala, a minimum for the standards could be adopted here. A standard width for a lane on an expressway is 3.5 m. Considering the heavy container movement expected after Vizhinjam and Vallarpadam, this is the bare minimum for a container truck. A 8 lane carriageway ( 4 lane for a start) would require a width of 28m plain. An emergency or parking lane would augur for another 3m on each side, necessitating 34m of asphalted/concrete surface for traffic movement. 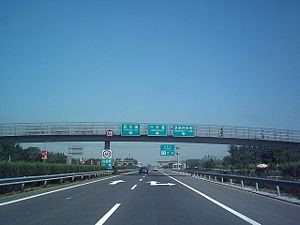 An outer shoulder of 3m and an inner shoulder of 1.5m is recommended on both sides of the dual carriageway. A central median of at least 5 m is essential for the safety of a high speed corridor, where kinetic energy carried by a swift moving trailer could easily swipe away a small-sized car on the opposite tracks. In total, a 60m wide road would still leave enough space for drainage and utilities ducts, avenue trees, crash barriers and safety features after all the above mentioned essentials. The earlier idea of a central canal and facilities for a bullet train along with the expressway appears a bit too far fetched. 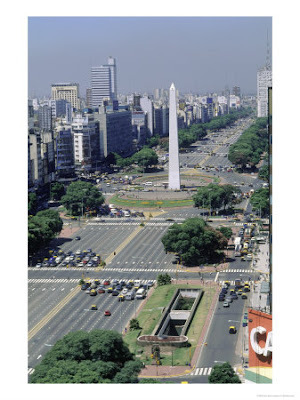 Oh, may be inspired by the world's widest avenue in Argentina (the first picture in the post), but let's have a modest beginning. Good ideas though, but let the most indispensable take shape now...Lets stop throwing up more dice to catch for the detractors. Developing the existing NH 47 and NH 17 to take place of the Expressway is out of question, the simple reason being those two highways cannot be access controlled. There are commercial establishments and residential enclaves all along the highway, not to mention the big towns appearing every 70 odd km. What we need here is a dedicated high speed corridor for heavy load traffic. 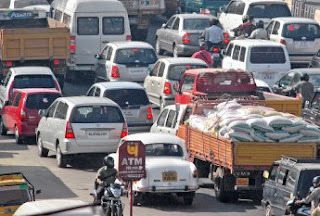 Anyone who traversed the Ernakulam- Palakkad highway knows well how the container trucks and lorries trail the traffic. Another point against the expressway was that it will be financially non-viable. Speaking about Economics, there are already a few agencies willing to take up the project, who knows exactly what they are doing. So why dint we leave it out for the experts? 'Expressway is built for the rich; it does no good for the poor'; this was the funniest argument I heard during those revolts against the project. Ok guys, lets go and close down our Airports and ban Rajadhani trains...after all its also not for people who cant afford a day's bread. Roads are built for common public, goddammit, and time is the most important commodity in the modern world. If a child from Kasargode could be brought to the Sree Chitra Neurosurgical Centre in Trivandrum in 5 hours time, it would be the most important role of this project. For that child, time may have been the factor running against her, not money. Well, when your bus cant shift into 4th gear on our highways and the average speed is nothing more than a gentle breeze, then we will start to rue our decisions. Exactly as how we are kicking ourselves for all the 'missed buses' of industrialisation. Minor alignment changes could be adopted in the plan (seen here) including the extension of the expressway from its present endpoints at Pallipuarm(Trivandrum) and Chalinkal(Kasargode). It doesn't need an expert to figure out that Vizhinjam must obviously be the starting point. It would also be better if the Expressway is extended to join the proposed Mangalore Bypass near the state border. If one project is going to turn the tables for our state then its the Expressway project. There are a hell lotta hurdles before the asphalt is laid for this road, but if those hurdles keep on distracting us we may never touch the finishing line.